Kind of accidentally, we ended up having an Ansel Adams calendar by our bathroom sink every year. Years and years ago I hung one there because there was a handy nail, thinking I’d figure out where it would go later. But now I love having it where I see the images every morning. Each year when I change to the new one, I hate putting the previous year’s pictures away. Like a painting, you can gaze and gaze into the images, see more and more, and it sparks more and more thoughts. 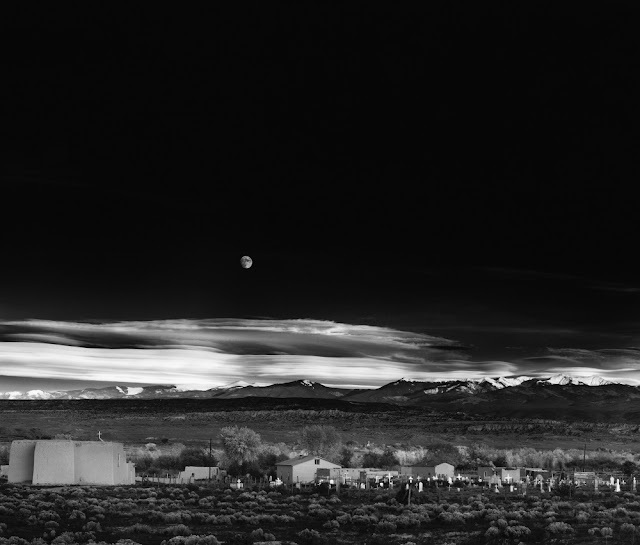 Last month’s image was this one, “Moonrise, Hernandez, New Mexico, 1941.” It’s always been a favorite of mine and I was glad to see it appear. Some thoughts. The moon in the middle of all that dark black sky reminds me of the many verses about Jesus being the light of the world. Look at the graveyard with the crosses and gravestones shining white in the moonlight. The graveyard and buildings look like a little town surrounded by a vast landscape. The clouds, too, are luminous. The word luminous is beautiful. I think of luna, the moon (in Latin--and Spanish), and, of course, light again. Luminous can mean glowing with reflected light -- reflecting the love of God. You are worthy of God's love. Jesus is with you. Give him your hand. A scientist who loves and welcomes science!